Director Katrin Hilbe and writer Julia Pascal collaborate to bring a well-balanced display of several themes: power (as a blessing and curse for women), national identity, and race. Hilbe’s often bold stage direction that saw Joan presented as a sexual commodity and subsequently assaulted, combined with Pascal’s fluent mentions of ‘breasts’ and other female icons from the Queen to Eve, made me appreciate Joan not as a warrior but as a woman. Both Hilbe and Pascal remained true to history in representing Joan, but the focus appears to be heavily emphasised on her position as a woman. Femininity ran throughout the play and was most tantalising during some of the more violent scenes. Joan of Arc was a woman, which is what I understand from this play. Hilbe and Pascal thread this theme so consistently throughout the play that it is near impossible for me to interpret St Joan in any other way. Everything about this evening was exceptional. Firstly: exceptionally good. An unusual location for theatre, which revealed itself as an ideal and intelligent choice by the director: the Gasometer’s intimacy and its team, open to courageous experiments, created the space for a chamber theatre requiring closeness and creating it. Three actresses, which have just been given awards as a trio in Dublin for this production, as best female performers (and one award for Katrin Hilbe for best directorial work) Juliet Dante, Rachel Halper and Samantha Pearl are an event which saddens only in one respect. 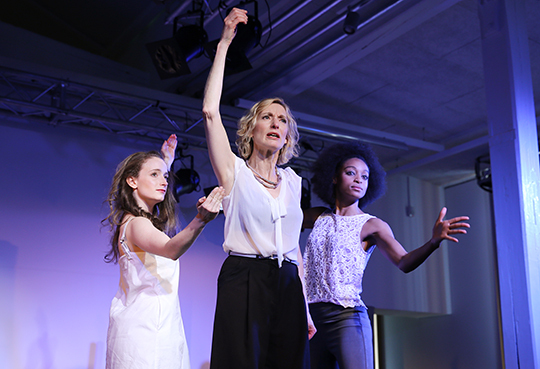 When again will we see in this region any other three so professional and in the best Anglo-American theatre tradition schooled women, who celebrate precision, dynamics, sensitivity and wicked humor? This is a visceral production which will hopefully be seen on the Dublin stage even after the end of the International Dublin Gay Theatre Festival, of which St Joan is a part of. This short play is a fast paced, eloquent and well directed, keeping the narrative moving without ever losing the audience. It is a highly amusing and physical performance that is not to be missed. The audience was challenged but not overwhelmed, emotionally moved and captivated. 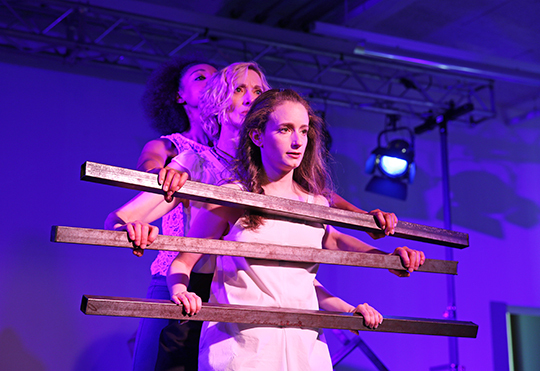 The intensity and power of the performances by the three women is exemplified in the scene in which Joan describes being burnt at the stake, how it feels to burn alive. The audience, at this point completely engrossed in her story, was feeling the same and shuddered at the experience. Here is a director at work who learned her craft from the ground up. She knows how to improve on already good foundations and in all modesty succeeds in achieving far more than what is usually seen at a theatrical event. 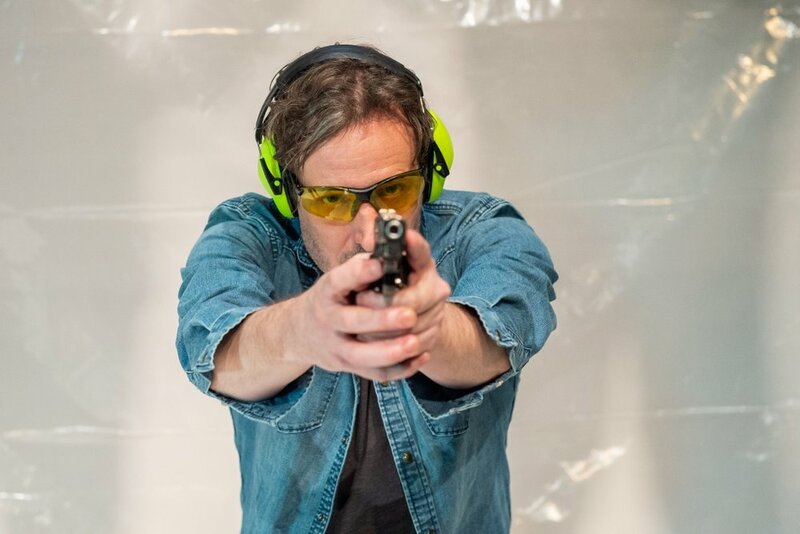 After a successful run at Theater Lab in NYC, Shooter performed at the OnStage! Festival, American Theater in Rome, at TAK Theater Liechtenstein and Theater Konstanz. A growing part of American society, stemming from the ethos of our current political leadership, eschews globalism in favor of isolation. As American artists we feel it is our duty to hold together the fibers of our interconnectedness. Our American problem of gun violence should not define us to the rest of the world. The importance of exporting our artistic works to European audiences is to demonstrate that we acknowledge the precarious fallibility of all our shared human endeavors.